C L Werner’s Black Library credits include the Age of Sigmar novels Overlords of the Iron Dragon and The Tainted Heart, the novella ‘Scion of the Storm’ in Hammers of Sigmar, the Warhammer novels Deathblade, Mathias Thulmann: Witch Hunter, Runefang and Brunner the Bounty Hunter, the Thanquol and Boneripper series and Time of Legends: The Black Plague series. For Warhammer 40,000 he has written the Space Marine Battles novel The Siege of Castellax. Currently living in the American south-west, he continues to write stories of mayhem and madness set in the Warhammer worlds. Matt Westbrook is one of Games Workshop’s newest authors. 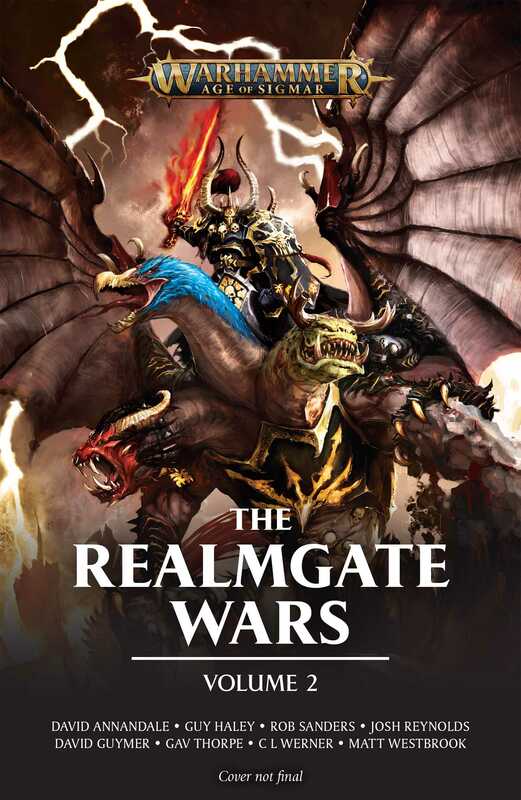 He has written The Realmgate Wars: Bladestorm for Age of Sigmar, and Medusan Wings is his first Warhammer 40,000 novel. He lives and works in Nottingham. David Annandale is the author of the Horus Heresy novels Ruinstorm and The Damnation of Pythos, and the Primarchs novel Roboute Guilliman: Lord of Ultramar. He has also written Warlord: Fury of the God-Machine, the Yarrick series, several stories involving the Grey Knights, including Warden of the Blade and Castellan, as well as The Last Wall, The Hunt for Vulkan and Watchers in Death for The Beast Arises. For Space Marine Battles he has written The Death of Antagonis and Overfiend. He is a prolific writer of short fiction set in The Horus Heresy, Warhammer 40,000 and Age of Sigmar universes. David lectures at a Canadian university, on subjects ranging from English literature to horror films and video games. Gav Thorpe is the author of the Horus Heresy novels Deliverance Lost, Angels of Caliban and Corax, as well as the novella The Lion, which formed part of the New York Times bestselling collection The Primarchs, and several audio dramas including the bestselling Raven’s Flight. He has written many novels for Warhammer 40,000, including Ashes of Prospero, Imperator: Wrath of the Omnissiah, Rise of the Ynnari: Ghost Warrior, Jain Zar: The Storm of Silence and Asurmen: Hand of Asuryan. He also wrote the Path of the Eldar and Legacy of Caliban trilogies, and two volumes in The Beast Arises series. For Warhammer, Gav has penned the End Times novel The Curse of Khaine, the Warhammer Chronicles omnibus The Sundering, and much more besides. In 2017, Gav won the David Gemmell Legend Award for his Age of Sigmar novel Warbeast. He lives and works in Nottingham. Rob Sanders is the author of The Serpent Beneath, a novella that appeared in the New York Times bestselling Horus Heresy anthology The Primarchs. His other Black Library credits include the The Beast Arises novels Predator, Prey and Shadow of Ullanor, the Warhammer 40,000 titles Adeptus Mechanicus: Skitarius and Tech-Priest, Legion of the Damned, Atlas Infernal and Redemption Corps and the audio drama The Path Forsaken. He has also written the Warhammer Archaon duology, Everchosen and Lord of Chaos along with many Quick Reads for the Horus Heresy and Warhammer 40,000. He lives in the city of Lincoln, UK. Josh Reynolds is the author of the Horus Heresy Primarchs novel Fulgrim: The Palatine Phoenix, and the audio dramas Blackshields: The False War and Blackshields: The Red Fief. His Warhammer 40,000 work includes Lukas the Trickster, Fabius Bile: Primogenitor, Fabius Bile: Clonelord and Deathstorm, and the novellas Hunter’s Snare and Dante’s Canyon, along with the audio drama Master of the Hunt. He has written many stories set in the Age of Sigmar, including the novels Eight Lamentations: Spear of Shadows, Hallowed Knights: Plague Garden and Nagash: The Undying King. His tales of the Warhammer old world include The Return of Nagash and The Lord of the End Times, and two Gotrek & Felix novels. He lives and works in Sheffield. David Guymer is the author of the Gotrek & Felix novels Slayer, Kinslayer and City of the Damned, along with the novella Thorgrim. He has also written The Beast Arises novel Echoes of the Long War, and a plethora of short stories set in the worlds of Warhammer and Warhammer 40,000. He is a freelance writer and occasional scientist based in the East Riding, and was a finalist in the 2014 David Gemmell Legend Awards for his novel Headtaker.